You only have one day to enjoy this beautiful and eclectic city? Make the most of it by doing it in the “bremisch” way - in other words, relaxed and laid-back. 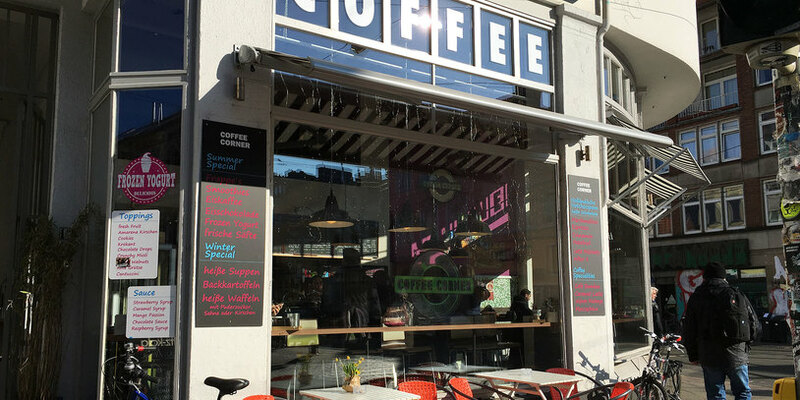 Start your day in one of Bremen’s most colourful and interesting neighbourhoods: The Viertel (the Quarter), where you’ll be spoiled for choice with the number of cafés and restaurants offering breakfast specials. The Viertel’s heart lies at the corner of Sielwall and Vor dem Steintor/Ostertorsteinweg. It’s always buzzing with activity and makes a great spot for people-watching. Enjoy breakfast at one of the numerous cafés in the area and watch the world go by. 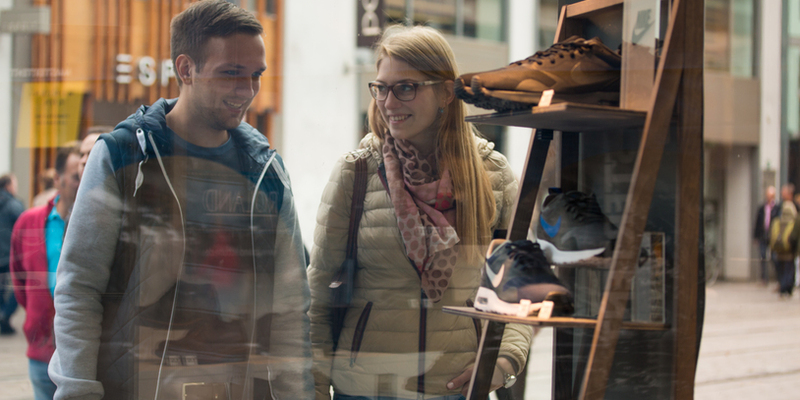 While you’re here, don’t miss the opportunity to explore the numerous shops and boutiques in the Viertel to do some truly special shopping. Major retailers are scarce here. Originality and creativity flourish and thrive: Hand-made goods, one-of-a-kind products, individually owned bookshops, gourmet food stores, and distinctive clothing are the order of the day. Try to find the time to stop by Holtorf Feinkost, not only to sample some of their delicious Bremen specialities, but also to see an example of a beautifully preserved shop interior which dates back to 1874. Now for a little culture: Continue along Ostertorsteinweg in the direction of the city centre where you’ll spot the Theater Bremen on your way the Gerhard-Marcks-Haus, the Wilhelm Wagenfeld-Haus and the Kunsthalle. Each of these three institutions offer visitors a different cultural experience. The Gerhard-Marcks-Haus holds contempary sculpture while the Wilhelm Wagenfeld-Haus has changing exhibitions pertaining to the culture of everyday life. 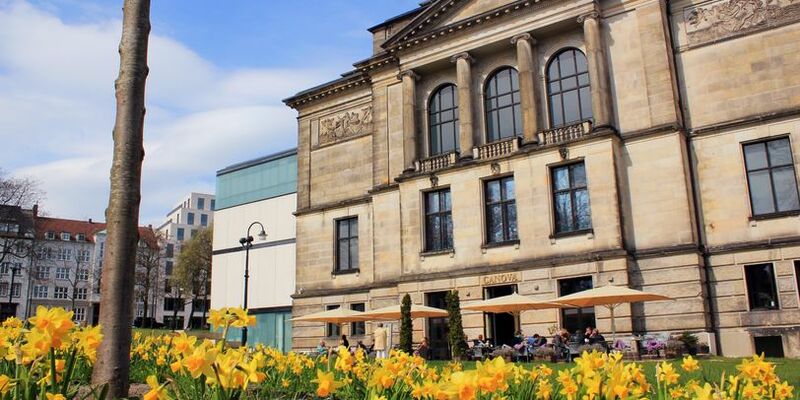 The Kunsthalle, counted as one of the most important museums in the country, has a magnificent collection with European paintings dating back to the 14th century, sculpture, and a New Media collection, as well as changing special exhibitions. 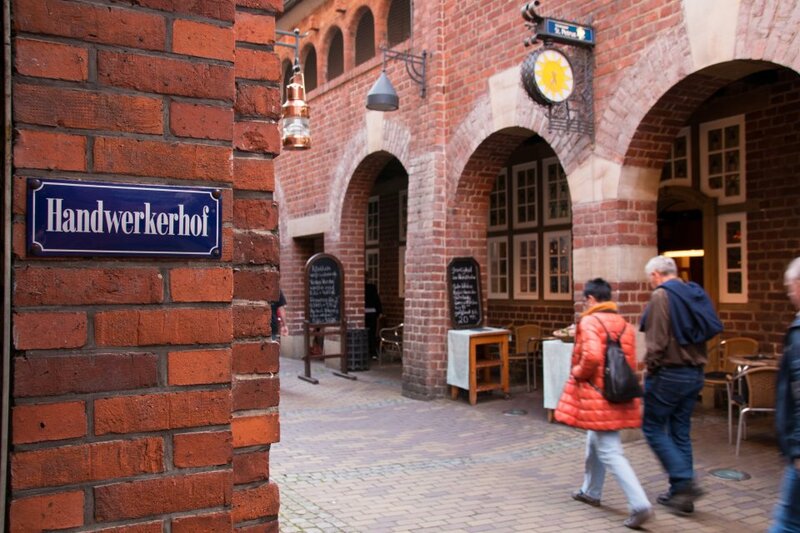 A bit further on from the culture mile, heading toward the centre of town and hidden behind the city’s modern façade, you’ll discover the Schoor, perhaps the most charmiv ng neighbourhood in Bremen, certainly its oldest. The medieval alleys are lined with one tiny colourful house after the other, like ‘peals on a string’; and thus the name - Schnoor - which means ‘string’ in Low German. 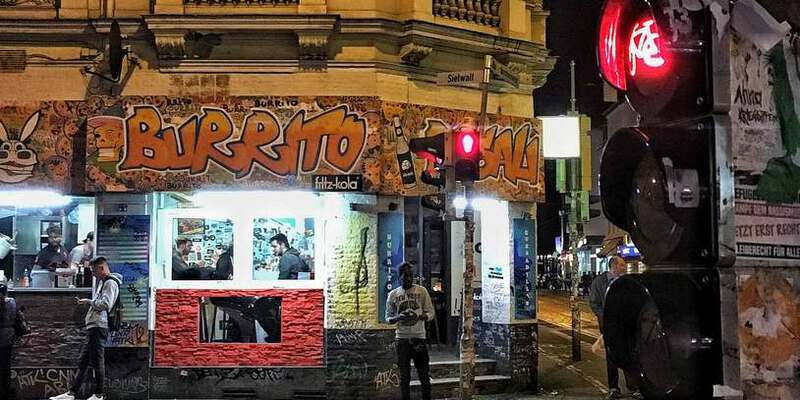 This neighbourhood is virtually stuffed with these delightful miniature abodes, brimming with their enticing wares. Numerous shops assure you’ll find that special souvenir and the range of restaurants assure you’ll satisfy any yen. Take time to try the delicious baked goods available at the cafes and tea houses. Their homemade cakes are made fresh daily and are not to be missed! 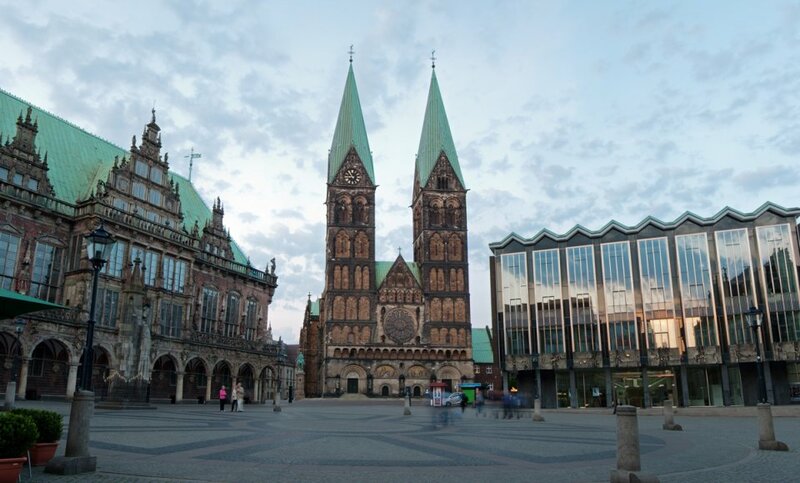 Leaving the Schnoor, head to St. Peter’s Cathedral on your way to the main square of the city centre. 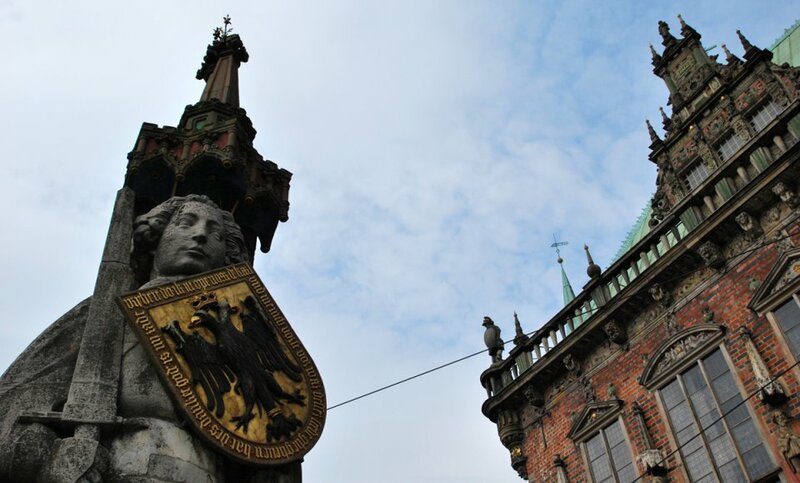 Located directly at the main square are a number of Bremen’s most famous buildings, including the statue of Roland and the historical town hall, both UNESCO World Heritage sites. 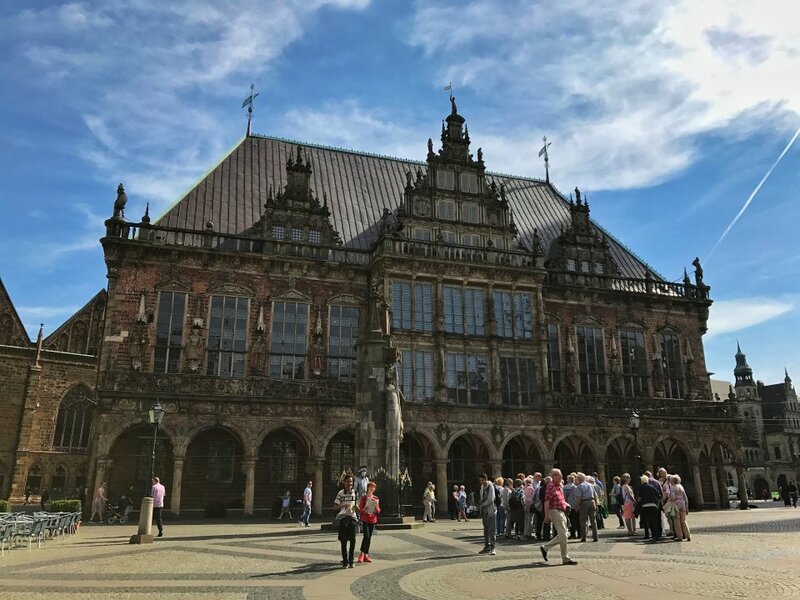 Walk along the side of town hall, passing the entrance of the ‘Ratskeller’ restaurant, and you’ll encounter the bronze statue of the Bremen Town Musicians from the Brothers Grimm tale. Perhaps you’ve noticed the donkey’s hoofs shine a bit brighter than the rest of the statue? Legend has it that grasping both front legs will bring you luck. So don’t pass up the opportunity! 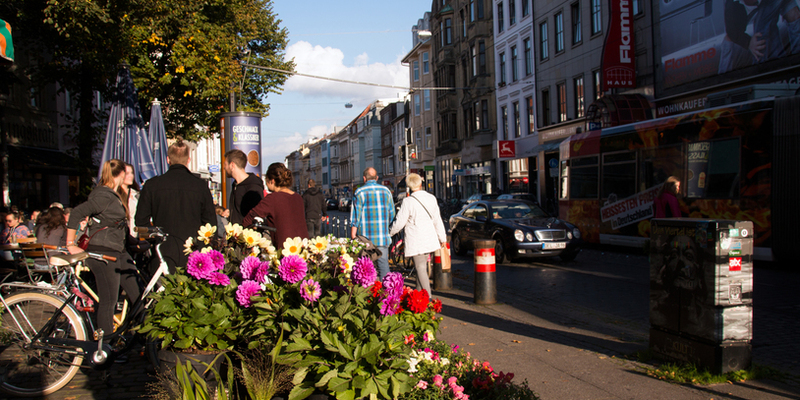 After you’ve seen all the sights, you can shop to your heart’s desire in Bremen`s city centre, where you’ll find your favourite brands and well as smaller individual shops, all conveniently located in a readily walkable radius. 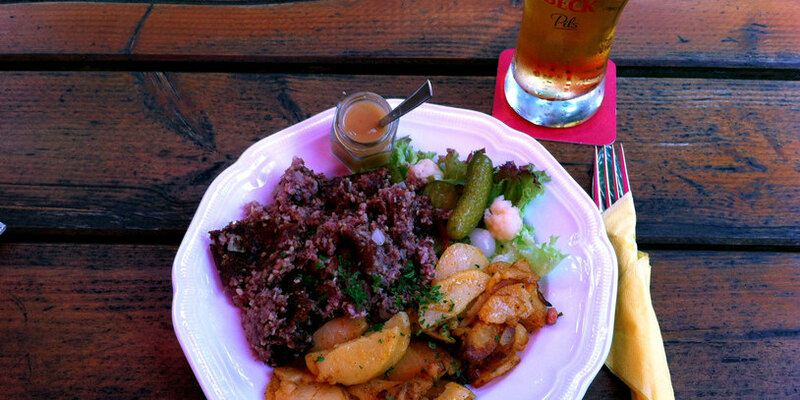 Sample the unique Bremen cuisine while you’re in town! A number of restaurants in the centre of the city serve traditional regional specialities, such as Knipp, Stinte or Labskaus. 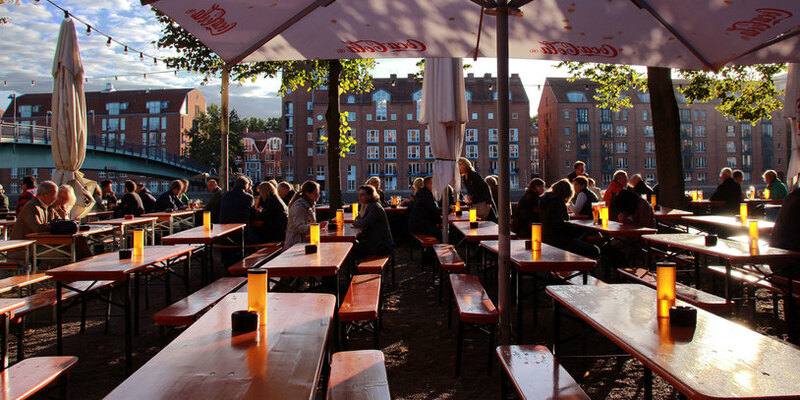 Bremen cuisine is hearty fare, so an after dinner stroll wouldn’t go amiss, and gives you the opportunity to visit the Schlachte, located just outside the city centre on the Weser promenade. The jovial maritime atmosphere invites you to take a beer or wine. If the weather’s fine, enjoy your drink from a beer garden overlooking the river. In the mood for a special cocktail? Then head to the Blauer Fasan. In der Saison locken zahlreiche Biergärten unter den freien Himmel an der Schlachte. Still raring to go? 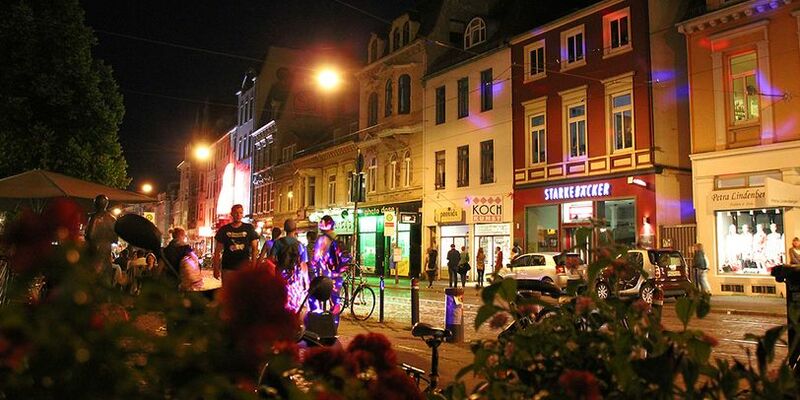 Head back to the Viertel for the night-life. Lots of lively pubs, bars, clubs, live music and dancing await you. Feeling peckish? Grab a tasty hot snack, prepared in a jiffy, from one of the many vendors in the area. A Bremen favourite is the “Rollo” – a pita bread loaded up with your filling of choice then rolled up and served with a dip. Now that hits the spot! You haven’t danced into the wee hours of the morning and wake up feeling bright-eyed and bushy-tailed? 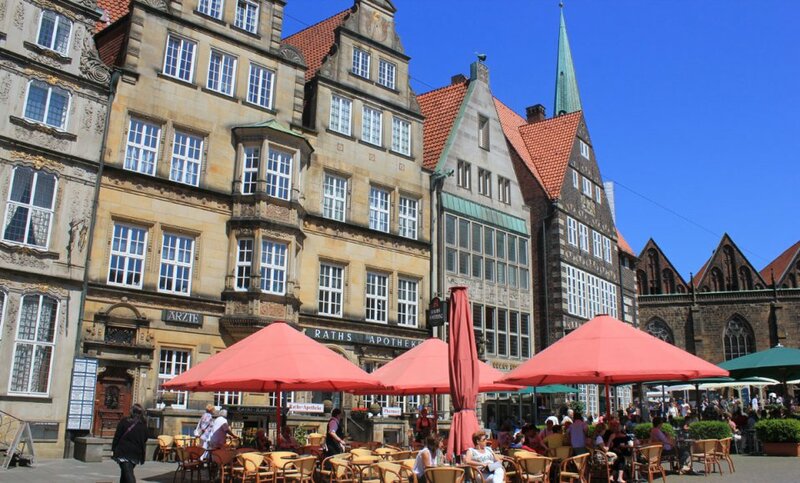 Then head to the Findorffmarkt to experience a typical bustling Bremen open-air market. 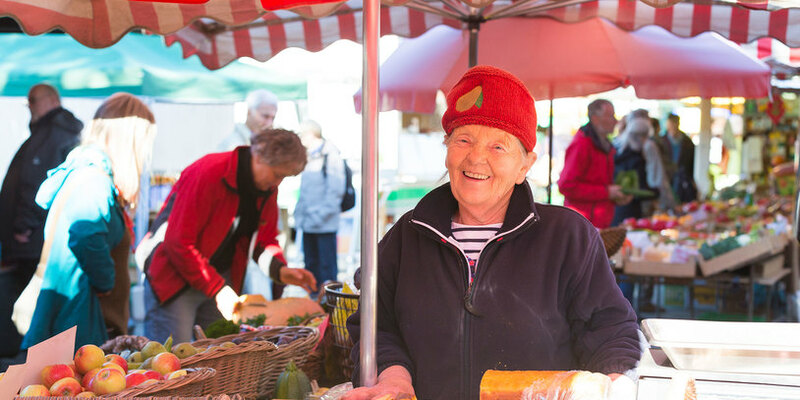 Every Tuesday, Thursday and Saturday you’ll find an abundance of fresh produce here. You can grab some breakfast and a coffee to go and head over to the adjacent Bremen Bürgerpark, a green oasis in the middle of the city, for some fresh air and a stroll. Perhaps you can even squeeze in a round of mini-golf or a bit of rowing on the Emma lake before heading home.